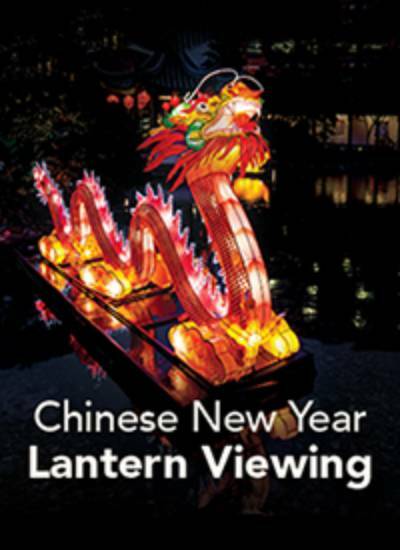 Four nights of traditional lantern viewings close out Chinese New Year festivities, when the garden glows with hanging red lanterns illuminating sweeping roof lines and the lake reflects the light of a large, illuminated 20 ft dragon lantern sculpture! Events include a traditional New Year Wishing Tree, a make your own lantern family activity, calligraphy demonstration, and musical performances. The highlights of the evenings are a community dance performance by the Portland Chinese Dance Troupe and a dragon procession by Lee's Association Dragon & Lion Dance Team. Vegetarian noodle boxes by Strait's Kitchen alongside wine & beer will be available for purchase. Complimentary hot cider will be provided. During Lantern Viewing Evenings, the Teahouse will be open with open seating (no reserved seating) and a $10 minimum (gratuity not included). Please note: No outside food, beverages, or chairs allowed. Seating is general admission. All evenings are rain or shine. No exchanges or refunds. You may donate your tickets back to Lan Su Chinese Garden if you are unable to use them and receive a receipt as a tax-deductible contribution for the face-value paid for the tickets (does not include processing fees). All donated tickets, along with your name and address, must be received by in the mail or at the Garden Shop no later than one (1) hour prior to show opening. An acknowledgment letter for the value of your donation will be mailed to you.